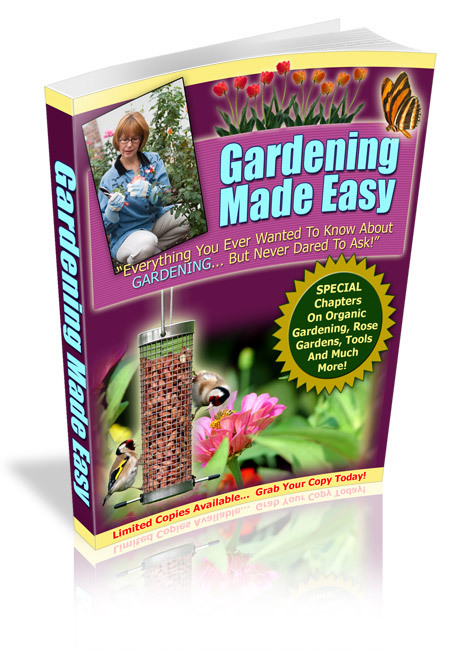 "Gardening Made Easy” will help you learn the basics of gardening, and get your own garden started and ready for showing off, even if your thumb is far from green." How many times have you promised yourself that you’d turn that extra space in the backyard into a garden? How many times have you looked out your window and wondered if this year was the year that you would finally have roses to enjoy? Have you and your family ever wanted to grow your own vegetables, free of pesticides and high prices? Maybe you just haven’t had the right tools, so you’ve had troubles getting started or maintaining a garden that you have planted. Have you ever felt like you could be doing more or that what you’ve learned just wasn’t enough? Are you ready to take your gardening desires from dream into reality? Well, the good news is that no matter how black you think your thumb is, “Gardening Made Easy” is going to change those garden daydreams and turn them into reality. Not only will you learn about the basics of gardening, but you’ll also learn specific tips on how to grow specialty plants and flowers. If you’re ready to start planting and maintaining a lush garden, “Gardening Made Easy” is the guidebook that you’ve been searching for. No matter what you want to learn, I am going to give you the ‘tools’ to get started and the answers that you haven’t found. And don’t worry if you don’t recognize any of these words, you’ll learn about them soon enough. Since gardening is more of a science in addition to being an art form, you’re going to need to learn about how plants grow and what they need to continue that growing cycle. 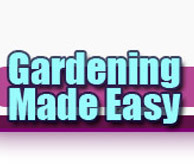 “Gardening Made Easy” outlines the process of nurturing plants in simple terms that anyone can understand. Maybe you’ve never touched a garden hoe or a bag of dirt in your life; that doesn’t matter. With “Gardening Made Easy,” you’re going to be getting your hands deep into the earth with the confidence that you are planting for success. You need to begin at the beginning and that means planning for your garden to grow. With these starting points, you’ll be able to create a garden that works with the space that you have as well as the goals that you want to achieve. Many people are looking to create their own garden so they can grow herbs and vegetables – without the toxins some farmers use. Knowing where your food came from can be a gratifying thing – and “Gardening Made Easy” will help you take pride in what’s on your plate. However, some gardeners want to make the outside of their home look beautiful to those that visit, so I’m including plenty of tips and ideas for you to get started on beautifying your yard too. The possibilities are endless when it comes to gardening, and so is the information. But wait…what about the tools that I’ll need? No worries there either. In “Gardening Made Easy,” we’re going to talk about the kinds of tools that you’ll need for basic gardening tasks as well as power gardening tools that can help make your life a little easier. The truth is that many gardening books are written for those that already have the basics down pat – but for those that aren’t quite as green thumbed, you might need some extra guidance. This book is filled with ideas and tips that are easy to follow, easy to understand, and most importantly EFFECTIVE. When you order “Gardening Made Easy,” you’re getting a resource that will grow with you as you learn about how to properly plant and care for a variety of plants. You’re getting the tools that you need to get started on a lifetime of gardening. Gardening is a relaxing hobby that can produce real, delicious results when done properly. From the scent of a rose in the morning to the crunch of a lettuce leaf that’s just come from the backyard – there’s nothing like working with the soil and seeing plants flourish. Preparation for a vegetable gardening is almost the same as for a flower garden with two exceptions. Irrigation watering is the best method for watering a vegetable garden, unlike a flower garden. A vegetable garden must have exceptional drainage. Root vegetables, especially, will rot in the ground with poor drainage. A raised bed is the easiest and most effective way to guarantee good drainage and for creating irrigation channels. Creating a raised bed is quite easy to do and can be accomplished in just three or four hours. Measure out rows for your vegetables making sure you will have adequate room to move between the rows to weed and harvest your vegetables. Next to each row, cut an irrigation channel approximately six inches wide and six inches deep. Tamp the soil down firmly on the sides and bottom of the channels. When watering, you will simply fill the irrigation channels with water. As simple as that, you have created raised beds and irrigation channels for your vegetable garden. You are now ready to plant your garden. As a general rule, the easiest vegetables to grow are: tomatoes, cucumbers, peppers, carrots, onions, squash, green beans, spinach and lettuce. These vegetables will provide you will fresh salads and vegetables all summer long and most are easily started from seed. However, for the beginning gardener, it is easier to buy the established plants from your local garden center. In addition to making it easier to get the garden established, buying established plants also makes it easier to resist planting too much. You should keep in mind that you will need to faithfully water and weed your garden all summer long, especially during the hottest months. Weeding is especially necessary, as weeds will rob your vegetables of essential nutrients and water. Therefore, when deciding how much to plant, keep in mind the maintenance needs of your garden. Take care also not to plant too much of a perishable vegetable, like lettuce, at one time so that you don’t have a large portion of your crop going to waste. GET IT NOW FOR $3.25 !